Remember that great 1997 David Fincher thriller The Game starring Michael Douglas? (For those that don't, it was a thrilling movie about a man who has everything, so for his birthday his brother buys him an extremely immersive adventure experience. But as the game gets more and more intense, the question becomes, is it real?) It was a very cool movie. Now, wouldn't it be cool to see a similar themed update, only a comedy that's actually funny as well as engrossing? Yes, it would be. And I can tell you Game Night is one of the most entertaining films I've seen in a while. The ensemble, lead by Jason Bateman, Rachel McAdams, and Kyle Chandler is great. The laughs are aplenty. And the sense of real danger adds excitement. Who is this movie for? 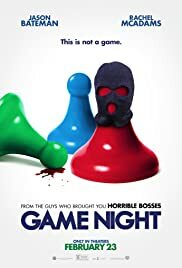 If you like films that blend comedy and excitement, not unlike you find with The Hangover trilogy, then I highly recommend Game Night. It's just fun. And there's not enough movies just made to be fun in cinemas these days.